The second stanza started positively for the visitors. Around the ten minute mark a CW penalty saw the Blue lineout drive get dangerously close. As the intensity ramped some argie-bargie resulted. CW was under pressure for a long period before Griffith broke away, for breathing room and a resultant penalty around the 25 minute mark. Mysteriously, with a very kickable opportunity in the offing, CW selected the scrum. After a tight-head loss, 80m later, a CW yellow card, a penalty try resulted, 10 – 7, ever so close and almost the TSN Turning Point! From the re-start, CW defense again looked porous as Westshore had the wind in their sails. They created scrummage superiority and along with some missed tackles, the affair’s result looked ominously disappointing for the Faithful. With CW having two ‘culprits’ in the bin, it took an amazing tackle from Keta to prevent a certain try. Makaroff returned from his penance and immediately made recompense with a huge tackle which saw him end up with the ball. Play moved to midfield and shortly after, it was all over. In summary, nice job by referee Blackwood with perhaps a little too much verbiage to explain rather obvious decisions. For CW, this writer liked Crawford, Horton, Makaroff and Samoya in the pack. At one point the backs looked unstoppable with Logan, Keta, Porter and Griffith scooting everywhere but it seemed to stall in the second half. I like newcomer Griffith; the Kanty to Sandner connect looked very competent in the first half and Gus Porter and Keta stood out overall. The Reserves Hard Hat went to Keta who, along with Horton was recognized by Westshore as M-o-M. For Westshore, Jimmo, Knowles and White in the forwards and Rowe in the backs, were the picks for me. And so it came to pass…… “Even Stevens” it was! Although outscored four tries to five, Hard Hat Award winner, Cam Hall led CW to a 28 – 27 squeaker on Saturday. The encounter did not begin that closely. From an early penalty CW drove the subsequent lineout and Pitblado saw a space at the ruck, dummied, took the gap and was over under the sticks, 7 – 0. Three minutes later CW returned to the line after good forwards’ work and quick hands and Pits forced his way over a mass of bodies for his immediate brace and a 14 – 0 lead. Next, Hall threw a wide “miss” to Kegode on the burst, when confronted by Tait he fed inside to Dalsin – a 40m attack and sheer gem. Down 0 – 21, Westshore responded with energy and in fact was to outscore CW, 26 – 7 the rest of the way! Vaa was recalled after a forward pass and the line wide open. CW demonstrated at this stage scrum superiority, forcing some desperate defense and Nacoko flagrantly committed his second illegal tackle resulting in a ten minute “breather”. It appeared that the hosts would take the match by the scruff only for Dawes to knock on a poor transfer. In the face of such adversity, Westshore responded. It took a sure tackle by Dalsin on Mosychuk to save a try but this foray gave Westshore a lift and with little time left in the half Ngawati broke a tackle and fed Tait for a 40m movement and well taken, first points. 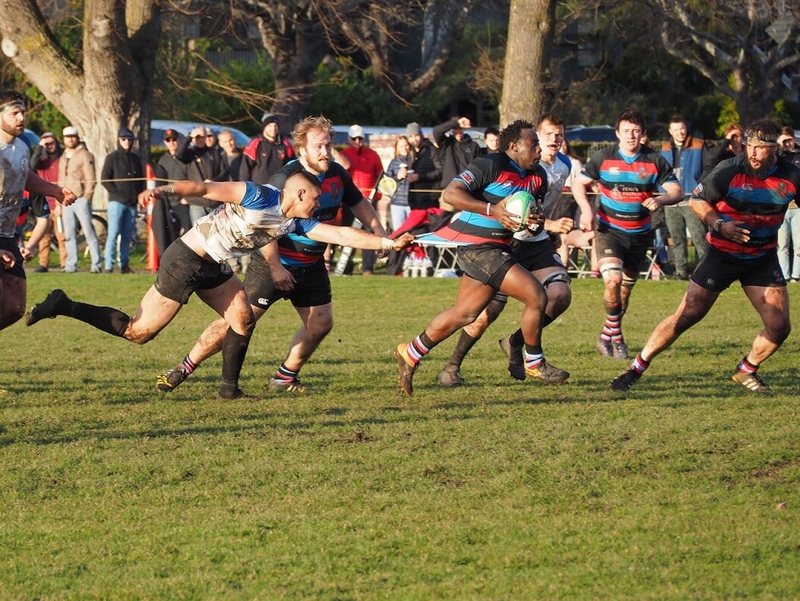 CW had a bad lapse from the re-start and the loss of focus saw Westshore gain possession by Mosychuk to feed Nacoko for a 40m gain and a pass to Ngawati to finish the instant 60m progress, 21 – 12. From having a throttle-hold, arguably loss of focus and a few missed tackles had clearly opened the door. Westshore started the second half with gusto, again re-gaining the kick-off and Mosychuk bursting from the ruck for a good gain and from that breakdown McClary was over with only two minutes of play, 21 – 17, seventeen points scored in the space of less than ten minutes! From here on, notes became garbled as the contest was so transfixing, notes went to the wind! It was around mid-half when a Westshore’s Mosychuk was sprung from sharp passing and the line was crossed out wide for a 22 – 21 visitor lead. CW had lost its early lineout precision; was making unforced errors; persisting with an unsuccessful “wide” attack hoped to be created but the passes were errant and although they might have had some field position, thanks to some desperate and sure tackles from Dawes and Schellie; things were looking desperate and in all, a certain kind of unravelling. Finally, from a penalty advantage, Pits did convert one out wide to Dalsin at full steam. He had some work to do but crossed for his brace, 28 – 22. Westshore seemingly gained a second wind aided by good performances from the bench and mustered some alacrity as both groups appeared gassed when a Casey Reed injury gave some breathing time. With mere ticks on regulation and some six minutes of extra, CW appeared to have a measure of control at the Westshore 22m. It seemed like kismet for the ruck to be lost and Westshore off with the ball and pace and when it got into Blue hands and 45m to finish, finish Dagg did only for it to end in yet another missed convert, 28 – 27. One could feel the tension in the House and fortunately, or unfortunately depending which side one favored, the visitors finished with a couple of knock-ons and that is all he wrote! In summary ‘well done’ to the officiating trio, with M-i-M, Derek Horton leading the way. For the visitors the pre-match predicted threats came to pass. Cole Mosychuk was the best player on the field; McClary scored a try and worked hard throughout; Tait scored a try; Ngawati scored a try and Nacoko was a constant threat with ball in hand. The Blues no doubt must have felt that fate neglected them as they traipsed off with only two competition bonus points after a valiant performance. For CW, Hall was awarded the Hard Hat and Westshore recognized Kelton Dawe and Balucci Kegode as M-o-M. We have come to take this team’s work ethic for granted and again, the starting eight were efficient and effective however this precision seemed to wear off as the fray progressed. I seemed to have noticed a fair bit of Sutherland throughout and Dawe’s M-o-M was due recognition. Hall’s eight point contribution was gold however imo, the rest of the backs were sporadic. Pits scored a well-taken solo pair, Kegode had some breakouts and Adibe looked for work. Schellie, a potent weapon, seemed starved although his defense was critical to the day. Despite Hall providing the winning margin, I rate Dalsin’s day as equal or marginally better given his two tries and a definite stop being special. Both teams take it on the road next week and they will need to sharpen their performances to save scalps! Off course 8 – 0 is a creditable achievement. Go, you good things and thanks to all thirty+ from both clubs on the field for a very entertaining afternoon.